I don’t think I’ve ever managed to get through a bedtime story without comments from the peanut gallery. Of course, that’s all part of story-telling – sharing thoughts and ideas and all that warm-fuzzy stuff. But my kids compete to yell out favourite lines and fight to turn the page which is why I instantly loved Interrupting Chicken. It’s time for Little Red Chicken’s bedtime story and with it comes a reminder from Papa Chicken to try not to interrupt. But Little Red Chicken can’t help herself! Whether the tale is Hansel and Gretel, Little Red Riding Hood or Chicken Little, as soon as the story gets going, Little Red Chicken jumps right in, saves the hapless characters from danger and promptly ends the story – “Don’t talk to strangers!” she shouts at Little Red Riding Hood and “Don’t go in! She’s a witch!” she warns Hansel and Gretel. 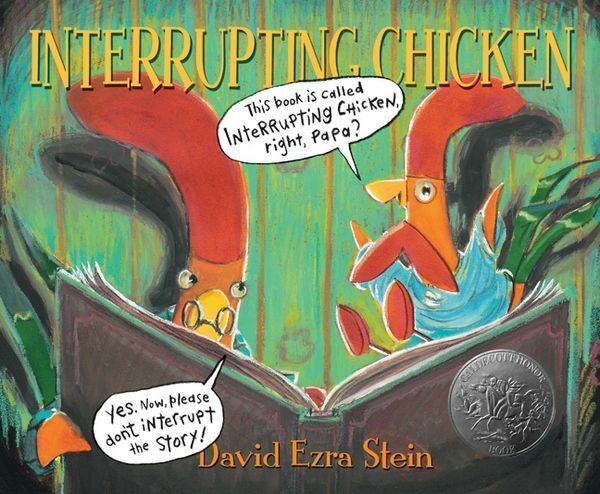 Interrupting Chicken by David Ezra Stein is cleverly illustrated to create a story within a story. Bright, punchy illustrations of Papa Chicken and Little Red Chicken alternate with the sepia ink sketches in the ‘books’ Papa Chicken reads from. It’s a neat strategy that creates a number of climaxes during the story, all leading to a very gentle, most fitting, sleepy-time ending. Interrupting Chicken is available at Book Depository for $16.93. Book Depository ship free of charge to Australia.